Many factors impact a student’s ability to read and learn successfully. There are two groups of factors, extrinsic and intrinsic. 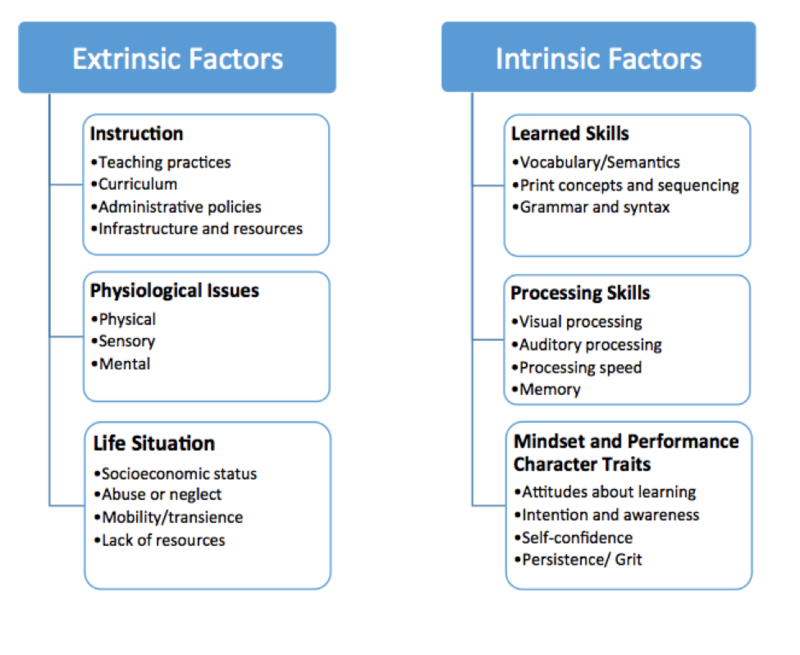 Below are examples of individual factors under each category. The list under each category is not complete but provides a representative example. Most academic testing only looks at the Learned Skills Category and does not address Processing and Mindset skills. If a student struggles with learning, it may be necessary to evaluate a complete set of factors in order to identify the causes and address the need. Ideally, each elementary school can develop a system to address any issue in each category. It seems schools and in particular teachers in general are receiving most of the blame for low state test scores. The system is doing more and more assessing and increasing teacher accountability. The current trends may be missing some critical elements of the challenge. Most children who struggle with learning entered kindergarten behind in the foundational skills that empower reading success. Most schools do not have resources and programs to provide the amount and breadth of individual attention, coaching, and instruction required to catch up these students.